This is an impressive, natural looking chalet constructed with chunky larch timbers which makes it look like it really belongs in the trees that surround it! It is located just above Les Houches village centre and is only a 5 minute walk to all the local shops, bars and the excellent 'Delice' restaurant. The Chambus also stops here which connects Les Houches to all the other resorts in the Chamonix Valley. The chalet is a 15 minute walk or 2 minute drive from the Bellevue cable car and the foot of the Kandahar piste. Rocky Mountain has been lovingly created using recycled timber, Australian hardwood and sun bleached driftwood, natural materials that give it a unique rustic character. Original furnishings from all over the world complement the design of the chalet and create a tasteful and homely place to stay. There are lots of comfy sofas and beautiful curtains throughout the chalet. The large kitchen and dining room is fully equipped for preparing and sharing the most delicious dinners. 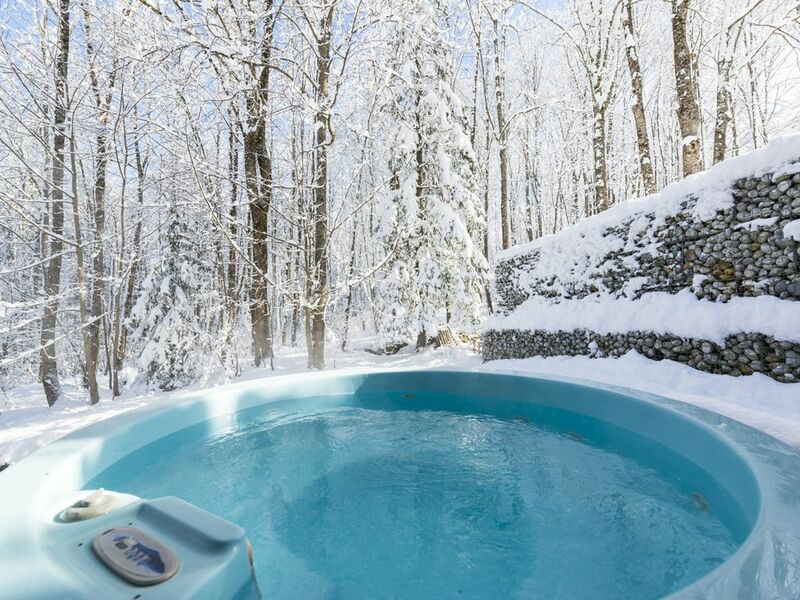 It has a huge deck with beautiful views and a lovely wooden hot tub overlooking the forest. All in all, a very comfortable chalet but not too 'precious' so an ideal place for families and large groups of friends. If you are looking for a 'one off' chalet where you can feel totally relaxed, look no further! Les Houches Village: With its spectacular backdrop of soaring peaks and sweeping glaciers, Les Houches combines the charm of a traditional alpine village with the splendour of high mountain scenery. There are some excellent restaurants and a few good bars in the village, but if you want serious nightlife you need to step out in Chamonix - stop by the Jekyll, a real old Irish pub with excellent food and music, the Wild Wallabies for something a bit wild and the ‘Garage’ for late night dancing until 4am. Skiing & Boarding at Les Houches: Les Houches has one of the most varied ski areas in the Chamonix Valley particularly suitable for beginners and intermediates. Enjoy stunning views of Mt. Blanc from the beautiful long woodland trails that wind their way down to the village. As well as being an excellent resort in its own right, the central location of Les Houches, in relation to the other Mont Blanc resorts, makes it an ideal base for adventurous skiers and boarders wishing to explore the whole Valley. Skiing & Boarding in the Chamonix Valley: Covering 14 resorts and 700kms pistes, the Mont Blanc Skipass opens up an unrivalled choice of skiing, including some of the longest and steepest runs in Europe. In the spring the valley provides simply the best off piste in the Alps, including the world famous 26km 'Vallée Blanche'. From the ‘Grands Montets’ (3300m) there are loads of off piste options and challenging black runs off the glaciers. You can also ski down into Switzerland from Le Tour and the pass covers you for a day out at Courmayeur in Italy. combination tub/shower, Corner bath with stunning views! Radiators, wood burner and fireplace. Available at an extra cost - please enquire for rates. With or without linen available at an extra cost - please enquire for rates. Stocked with some basic pantry items, take some leave some! BBQ, large picnic table, outdoor chairs. Cleaning available at an extra cost - please enquire for rates. Linen and towels can also be provide at an additional cost. We take a £500 Cleaning and Breakage deposit - fully refundable. N.B. No smoking in chalet, ashtrays provided for terrace outside, good chance to look at the fabulous views! Nous avons passé un agréable séjour dans ce charmant chalet, très authentique avec tout l'esprit de la montagne! Très propre, charmant. Très confortable pour passer quelques jours de détente en famille ou entre amis! Allez-y, n'hésitez pas! Fantastic, relaxing holiday in this beautiful chalet that has a unique character and atmosphere. Another great holiday for us in this magical 'tree house' chalet! The kitchen had everything we needed for cooking and the living room had lots of comfy sofas for reading, relaxing and playing games - we had many fun evenings in there! We had plenty of hot water and we love the new shower room Steve. Thank you to Valentin, nothing was too much trouble for him. The kids loved playing in the garden and hot tub and made a cool den in the woods! The scenery is magnificent and there is so much to do in the Chamonix Valley and surrounding area. We will definitely see you again next year! It was a very pleasant stay in this nice chalet with all commodities. So lovely mountains around! I love the fact that it is an extremely welcoming chalet in its design and atmosphere. Although a healthy walk (10mins) into the town and to catch the bus to the slopes, we all found it rather invigorating - you can of course drive. The kitchen is well equipped with a rustic large table for everybody to relax and eat. The sitting room is spacious and great for relaxing. All the bedrooms are roomy and light and there are plenty of bathrooms. I loved the balcony and terrace on a sunny day - pure bliss. 1 hour from Geneva, 20 mins from St Gervais Railway Station and 5 mins drive from Chamonix, Les Houches is the first ski resort that you come to as you enter the Chamonix Valley. It is in a spectacular mountain setting dominated by Mont Blanc, which at 4805m is the highest mountain in Europe. 7 nights self catered accommodation; electricity, heating, hot water and local tourist taxes. Does not include: towels & bed linen (can bring own or hire for £20.00 per person); final chalet clean (from £90 - £200 depending on size of chalet and length of clean), firewood (£40 for chalets with log fires) or telephone. A credit card swipe will be required for security. WEEKENDS/PART WEEKS AVAILABLE IF YOU CANCEL YOUR HOLIDAY Cancellations must be advised in writing and signed by the person who signed the booking form or paid the deposit. Cancellations are accepted as from the date written confirmation is received by Barrelli Ski Ltd. If you do cancel, the amount of notice you need to give us before your scheduled departure date and the cancellation charges we apply are as follows: i. More than 56 days....……….loss of the deposit. ii. 28 - 56 days...............………..50% of the holiday balance. iii.14 - 28 days..................……..75% of the holiday balance. iv. Less than 14 days……………..the total holiday cost. See Barrelli Ski website for full terms and conditions .